The new CORTEX 3D-Gyro is a universal 3-axis stabilization system for fixed wing model aircraft. It is compatible with all commonly used R/C systems, due to its standard R/C inputs and outputs. Extremely smooth flight characteristics - even in strong, gusty winds. Faster training - Adjustable gyro assistance – Precise flight 3-axis stabilization system for all model aircraft. Supports up to 5 channels, e.g. The CORTEX Gyro is a stabilization system for fixed wing model aircraft. And hence an absolute world first in this form. The new brain and heart of your high-quality aircraft – immediately ready to run. 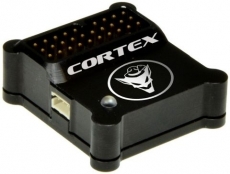 The CORTEX does not require any PC or additional software settings - unless it is desired. The CORTEX comes with a sensor unit, connection cable harness, adhesive pads, USB connection cable and exclusive design and information material. There are software and firmware updates conveniently on the web. Since it means pure flight fun with the greatest possible carelessness. No or hardly any more additional spending due to crashes. You will train faster with the CORTEX whereby the adjustable stop level helps. However and primarily for experienced pilots or demons among you, the CORTEX is indispensable from now on. Cable loom for receiver connection, USB cable, Jumper for programming.